August 9th: sunny. It's cool in the shade despite the sunlight's intensity. Quite rare for a summer day in New York, this weather reminds me of the west coast some thousands of miles away. We leave the City shortly past noon, and bend from a two-laner into another across northern New Jersey. This is a back-road trip: two motorcycles chasing "lines" rather than "dots" — cities and places of interest — that they connect. We hit the Delaware River in northwestern New Jersey and start riding north. As we re-enter New York State, the winding road takes us into the "Hawk's Nest" area where the view of the River down the cliff is literally breathtaking. 10th: fine after light rain. We're now leaving the Delaware River Region, wiping misty rainwater off the shields of our helmets. After the rain stops in the late afternoon, we change direction to the west toward the Finger Lake Region. Night is already deep when we arrive at the city of Elmira where Mark Twain spent summers in his thirties. A little boy comes along with his mother to where we were stopping to look for a motel, but is too shy to speak to us. As the motors restart and rev away, he screams something on the night-soaked lawn. The sky clears on the 11th and makes you sweat when not riding. Soon after we get back on the road, I notice the geographical features have changed. The average sight distance has increased, and there's more yellow in the landscape now, after the constant dominance of green. We're getting close to the State's westernmost region. Obvious along the road are fields of corn, and dairy farms are larger here than those we've passed. A lone American bison crosses the county road, and walks into the front yard of someone's house. The 12th is a "dot" day to rest the bikes and ourselves. We cross the border, and take a hotel room in Canadian Niagara Falls. A massive amount of water falls into the basin, and above the crowd of people towers a giant of white spray blown in the wind. We came past the border into Canada. 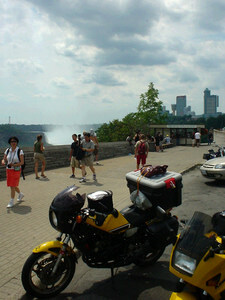 This is the first time for me to be in Niagara Falls. The enormous flow of water was overwhelming but somewhat gentle: Watching it go on soothed my mind. The splash from the fall's basin reaches a surprising height. We spent some time sightseeing, resting ourselves.